This little invader isn’t particularly pretty, or unique, I’m not starting with some sporty iridescent beetle or fabulous butterfly- it’s a pest. In May it makes itself known by making artistic (or not) lace out of deciduous tree leaves. Bruce spanworm is found throughout B.C. and unfortunately, all over North America’s temperate zones The winter moth was introduced into North America from Europe, and was first recorded in Canada in (well, actually my sources don’t agree on a date, but it was at least 60 years ago), in Nova Scotia. It was first found in B.C. in 1977 on Vancouver Island, and is now found on southern Vancouver Island and the Lower Mainland. This bugger is everywhere. I start to see spanworm damage coming in mid Spring, usually May, with customers brandishing a forlorn baggie of laced leaves, ragged edged with holes and somewhat fractal patterns to the lacing. “What the hell is eating my tree?” They’re irate or sorrowful or both. I swear, sometimes the buggers seem to choose the best tree in the front yard to munch on- but the fact that they feed on maple, birch and cherry trees might have something to do with that. What to look for: sudden skeletonizing of leaves in May, A hairless light green wormlike caterpillar with black or dark brown head and dark dorsal stripe under the skin. It may be apparent, or rolled up in a corner of leaf with a smidgin of webbing. Eggs are bright orange and may be found in bark crevices, lichens or mosses on the tree. A gossamer shred of webbing may be present in the vegetation under the tree. And now, what you really want to know-what do you do about it? Options? (and I’m not even going to include chemical sprays because they’re gone very soon, and you might as well learn to deal with it now.) #1: Btk. 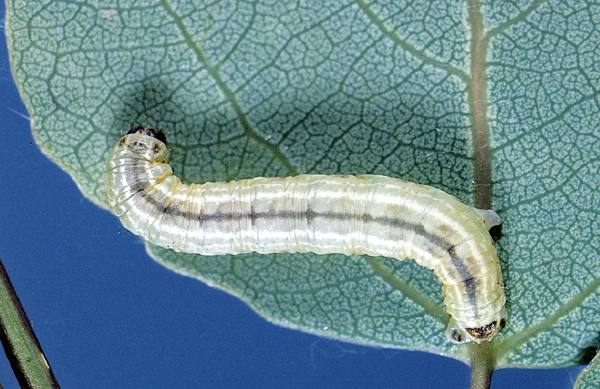 Bacillus thuringiensis (Bt) is a bacterium that is found naturally in the soil and is known to cause illness in various insect larvae, including caterpillars of pest species such as gypsy moth, spruce budworm and cabbage looper. The Btk used for caterpillar control is the HD-1 strain. You spray it on the leaves of the affected plant, and when the caterpillars eat it, it starts working in the stomach. The bacterium multiplies and releases toxic substances, shutting down it’s digestive systam and killing it. Btk presently comes in a red bottle. If they change the package, I’m always a bit miffed because the damn thing seems invisible until you realize it changed it’s look. You may need to spray more than once- larvae are susceptible but unhatched eggs aren’t. If you only use half a bottle of Btk, put it in the fridge and use the rest later- like a food product, bacteria is perishable. Option #2 is banding the tree which is effective for preventing next years’ population, but won’t do a damn thing for the present situation. Still, a tree can take being defoliated one year if it’s healthy, while several successive years may render it a sorry specimen with reduced vigor and ability to fend off other diseases and insects. Banding is simply placing a cardboard strip around the tree trunk with something sticky on it like Tanglefoot. The wingless females of the species must climb up the trunk to lay next year’s eggs and you can stop them then, interrupting the life cycle. Banding should be done by mid August in the Pacific Northwest, or you may miss some.